Calling all fans of alt-rock and emo, we've got an important event coming up for you!! Taking Back Sunday are going on a massive North American Tour with Every Time I Die and All Get Out! They'll be rocking out at Stage AE on Wednesday 16th August 2017 – will you be?? Grab your tickets fast to be sure of your place!! Formed in Long Island, New York, with the current lineup consisting of Eddie Reyes, guitarist and founding member, Adam Lazzara, vocalist, John Nolan and Adam Lazzara on further guitar, Shaun Cooper on Bass and Mark O'Connell on drums, the band saw their first mainstream success with their album “Louder Now,” in 2006, mostly due to the success of the first single “MakeDamnSure,” which charted on the Billboard Hot 100 and has been listed on Rolling Stone's "The 100 Best Songs of 2006" list. The band are now on tour promoting their seventh studio album, “Tidal Wave”. One of their most unusual albums to date, the album takes includes from artists such as Bruce Springsteen, Tom Petty and the Gaslight Anthem, the release features a sound that combines the band's signature pop punk, alt rock and emo sound with that of folk and heartland rock. Released in September 2016, the album was met with warmth from fans and critics alike. With Entertainment Weekly calling it "eclectic and sensitive," and adding that "If emo is something that pigeonholes, Taking Back Sunday is making noble attempts to abandon those impulses—with Tidal Wave, the band is both emo and something else entirely." 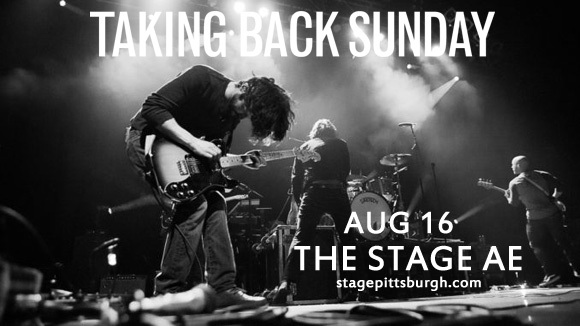 Don't miss out on your chance to hear all this live – get your tickets to see Taking Back Sunday NOW!! !